David Shipps is a Nashville-based orchestrator, conductor, and arranger whose work includes album projects, live events, video games, film, television, lawn mowing, and more. I spoke to David about his background, working in Nashville, his orchestration workflow, and much more. When did you begin to suspect that you might pursue music making as a career? I don’t recall the exact moment, as music had been a vital part of my life since starting piano in Kindergarten. But at some point in high school, all of the music lessons, band rehearsals, and time spent in my room writing my own music made it clear that’s what I wanted to do in my life. My mom still tells the story about how I would say, “Surely there’s a way that I can be a regular person who has a family, lives in a neighborhood, cuts his own grass, takes his kids to school, and makes his living writing music.” I guess I nailed it, even the part about cutting my grass. What influence did mentors or role models have in your career choice? Well, as a kid, I wanted to be John Williams. I think if we’re honest, most of us still have that dream! If I added up all the band directors, piano teachers, private lesson teachers, and church music directors, I would honestly have too many music role models to name. But I think it goes to show how it’s often a cumulative effect of all of these folks playing a role in a young person’s life. I would be remiss though if I didn’t mention that my parents started me off on piano when I was in elementary school. I can’t thank them enough for that. To many people who live outside of Tennessee, Nashville might not be the first place they think of for film and game music creation, orchestration, and music prep. What brought you there? I originally moved to Nashville to explore opportunities as an arranger in the Christian music publishing market as most of the sheet music publishers make their home in Nashville. Over the next 10-15 years, those opportunities allowed me to hone my skills as an arranger, but especially as an orchestrator, having arranged/orchestrated over 350 works for various genre, ensemble, and performance purposes. Can you describe some of the advantages you’ve experienced being a part of the Nashville scene? First things first – Nashville is in the South. That means folks are fairly down-to-earth, friendly to strangers and relatively laid back. And the same goes for many of the musicians I know. This friendliness is what afforded me some of my first opportunities to observe sessions. And the “team” attitude amongst the musicians has resulted in scenarios in which players would offer positive feedback and even constructive criticism on my arrangements – a very helpful thing indeed to a young arranger! What a typical work day looks like for you? I’ll be honest – I’m not really like most musicians I know. I don’t drink coffee, I don’t typically work late at night, and I’m not really that “artsy.” So, the 8-5, Monday thru Friday routine works best for me. That said, my schedule usually falls into two types of days – orchestrating (which I normally just call writing) or conducting. For conducting days, I’m usually gone from first thing in the morning until dinner, since Ocean Way Studios (where I typically conduct), is about 45 minutes away, Most of the time, sessions take up the majority of the day, so not much writing usually gets done on those days. When I’m writing, I typically split my day up into two chunks – morning (before lunch) and afternoon (after lunch). You’ll see that lunch is a very important part of my schedule! If I’m under some tight deadlines, I’ll work hard to accomplish as much as possible before lunch. That’s because when you work at home, sometimes the afternoons can get a bit distracting. And if I’m honest, when it’s nice outside and my two boys are done with schoolwork, it gets really tempting to bail out of work early! Can you describe a typical orchestrating workflow? The other type of orchestrating I do is that which would fall into the more traditional role of an orchestrator – working with a composer’s material and putting it on the page in all its detail. In those cases, I’m working hard to “get into the composer’s head” by listening intently to the audio stems provided and paying close attention to the MIDI document as well. After listening thru the piece as a whole, I will essentially “deconstruct” it and work through each of the families (typically strings first) until the piece is put together. I’m constantly listening to the audio and referencing the MIDI, in an effort to truly achieve the composer’s intent. On your website you’re described as an active orchestrator, conductor, and arranger; and I know you’re a composer, too. Are there certain roles you enjoy the most? At this point in my career, I spend most of my time as an orchestrator and conductor. I still have clients whom I arrange music for, but those calls are less often and typically for smaller projects. I’ve discovered over time that my areas of giftedness lie in orchestrating and conducting. Based on my personality type, I do much better working to improve material that already exists. Starting from scratch on an idea is often difficult for me, and I find that the lack of boundaries often actually limit my creativity. But when I start with some existing material, even if it’s a sketch, my mind naturally begins creating. Well, if that doesn’t sound like the recipe for an orchestrator, I don’t know what does! And when it comes to the conducting, well, if you know me, you know there a side of me that’s very extroverted. So, standing on the podium in front of 40 musicians honestly feels very natural to me. And when I’ve spent the last two weeks in my office every day staring at a computer screen, being around a bunch of folks is a real treat! Can you describe the process of handing a Finale score over to a colleague to prepare the parts for the studio reading/performance? I’m fortunate these days to be busy enough that I have a close colleague, Rob Adams, who does almost all my part preparation for me. But that wasn’t always the case, and I did all of my own parts for many years. Therefore, I feel as though I have a good handle on what condition the score needs to be in prior to sending it off for parts. As a habit, I do my own editing while I orchestrate. Cleaning up hairpins and dynamics, expressions and such is all part of my writing process, (however, since I write in concert pitch, there will be some cleanup when transposed parts are created). Since I always send off a draft of each cue to every client for review, I’ll go ahead and prepare the score in page view, fitting measures to systems and adjusting anything that seems out of place. And, if I’m going to be conducting on the project, this is my opportunity to lay out the score how I’d prefer to see it when I’m on the podium. Typically, once I’ve cleaned it up enough to send off to the client for review, that’s the last time I’ll touch the score file (barring any adjustments or edits). Rob usually takes it from there for the part prep process. Next time I’ll see the score will be on the podium, and honestly, I rarely ever look at the parts. I trained Rob pretty well (I think), and he’s proved himself over the years to be worthy of that trust. 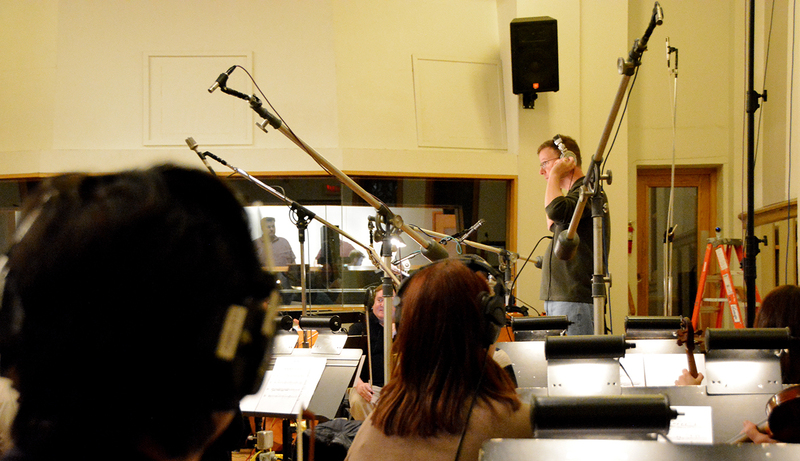 Do you approach orchestrating for film differently than a video game project? In a word, yes. However, a lot of the differences in approach have more to do with considering how the music will be recorded. That’s often what affects my orchestration decisions. A movie is often a bit more “cut and dried.” Once a film is completed, it’s going to play out the same way every time. Braveheart doesn’t end differently when you watch it as compared to when I do, for example. But video games are unique in that the user experience often dictates the pacing, direction, length and final outcome of the game. So, the music can’t be designed to fit only one story path. The inherent problems that arise out of that are mostly up to the composer to solve, but I do my best to be helpful by putting as many musical options on the page as possible. Here’s an example: In the recent game Call of Duty: WWII, Wilbert Roget II composed a beautiful passage in a piece entitled Home Suite. He initially scored it for a solo string instrument with full string accompaniment, as well as some synths and piano. However, his voice leading lent itself beautifully to a brass chorale setting as well. So, I wrote out two options for brass chorale – a more subdued version with French horn as the soloist, and a slightly fuller setting with a cornet solo as the lead. Was I taking some creative license? Probably, but here’s why: a video game needs a lot of music at its disposal, and a composer will never be able to write new material for every possible scene. So my contribution allowed for the music editors to have the “home” theme in three different settings, allowing them to underscore more minutes of the game without asking Wil for more music. It’s been a busy 2018 so far! I orchestrated four episodes of the TV show Taken, for composer Trevor Morris and am currently working on three movies with him. I’ll also be diving into orchestrating for two video games (but I’m sworn to secrecy on those titles), as well as conducting for several other projects. Sprinkled in there are several smaller orchestrating projects for publishers here in town as well as orchestrating and conducting on two custom artist projects. Thanks to David for generously taking the time to provide such detailed and thoughtful replies. In fact, we saved some of David’s excellent Finale tips (and a look at his setup) for a follow-up post. Stay tuned.